Let impassioned Italian design steal your heart. 1 spacious storage area with a sliding pocket glass door, adjustable shelves, and room for our 9-glass Stemware Rack *. 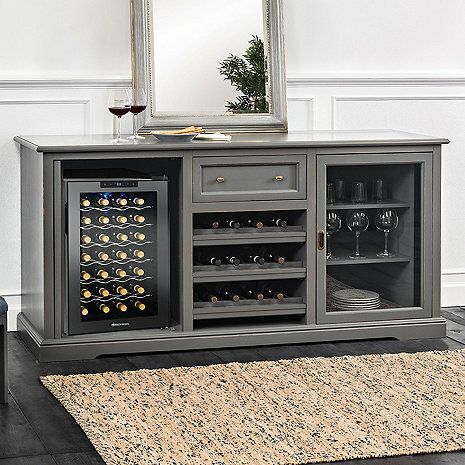 Our Sienna Credenza is designed to fit our new 28-Bottle Touchscreen Wine Refrigerator*Included*. Important Note: When installing the 28 bottle units into your credenza, you will need to remove the back panel. This easy process requires removing the screws from the back of the unit. Plugs Directly into US 110 Volt outlet on a Dedicated 15 AMP line. Plugs Directly into US 110 Volt outlet on a Dedicated 15 AMP line. Plugs Directly into US 110 Volt outlet on a Dedicated 15 AMP line.